Twin poppies growing under a Gemini Sun in Brighton, UK. The Sun entered Gemini on Sunday night. Gemini is the third sign of the spring season, a mutable air sign. Mutability is the energy of transition; spring is melting into summer; and, down under, autumn is melting into winter. When the cardinal sign takes over (the next one being Cancer), there is a surge of energy and a new season begins. For now, we have 30 more days of the days getting longer, at least up north. With the Sun newly in Gemini, it's been making aspects to a bunch of planets and points that are located early in their respective signs. These include Chiron in Aries, Uranus in Taurus, Venus in Cancer, Transpluto in Virgo, M87 (a massive galaxy) in Libra, Pholus and Quaoar in Capricorn, and Mars in Aquarius. If there's an opportunity for the world to change overnight, this might be the opening. 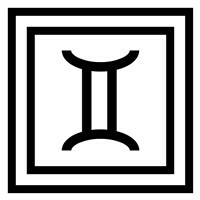 However, this would have to follow the guides presented by the Gemini Sun, which are to maintain a balanced perspective and an actual dialogue, and to do your best to get along with yourself and with others. The Sun's new transit highlights three of the most significant conditions of the spring and summer, which include the nascent transits of Uranus across Taurus and Chiron across Aries. Even one outer planet sign change can shift the energy palpably; we have more than that, particularly if you count Pholus and Quaoar in early Capricorn. These are factors that make a compelling case to deal with the relationship between family, corporations, and government. Capricorn covers all three environments, though Pholus (a centaur) and Quaoar (one of the major discoveries in the Kuiper Belt, near Pluto) both specifically address family constellation issues and generational issues. Pholus adds the theme of substance dependency and abuse. "Substances" does not just mean drugs and alcohol. I would consider certain psychic properties to be every bit as addictive and damaging as abusing something like alcohol, and the more insidious for being less obvious. By mental habits I mean things like jealousy, deception, self-deception, and various shades of sabotage. Particularly here in the relatively wealthy Western world, we need to raise the level of our priorities. As the Sun makes its many aspects over the next week or so, we will get a tour of what is possible, what we need to consider, and see some options for choices that we need to make. Please keep your eyes open and your ears on.